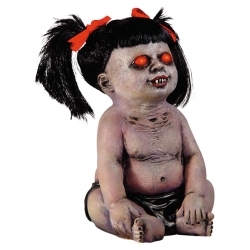 This scary, creepy Baby hanging Halloween Prop is one of our creepiest newcomers. Whether you choose to hang him up, tuck him into a cot or place him in a crawling position on the floor, we guarantee he will send shivers down everyone's spine. We recommend adding some of our Joke Vomit for extra effect!